ISLAMABAD: Saudi authorities have denied a request by the Pakistan embassy for consulor access to Zaid Hamid, a self-proclaimed security analyst jailed in Saudi Arabia. 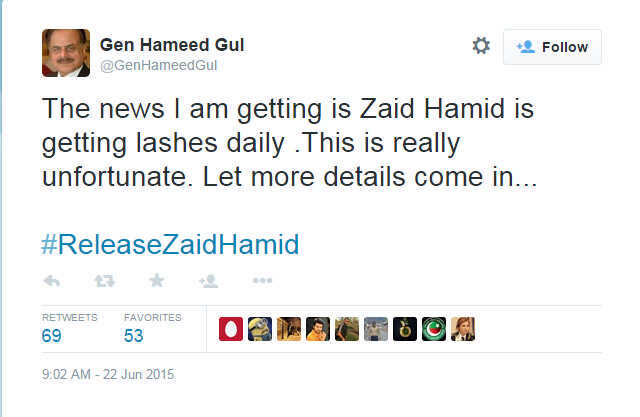 In Medina, a team from Counsel General Jeddah was denied access to Zaid Hamid and was not allowed to meet the analyst. Foreign Office spokesperson Qazi Khalilullah, responding to a question, denied knowledge of the sentence given to Zaid Hamid and said it had not been confirmed by Saudi authorities. The spokesperson further said that with the efforts of the foreign ministry, Hamid’s wife has been able to meet him at Madina prison. Diplomatic sources had said that Zaid Hamid was arrested last month for making an alleged provocative speech in Madina criticising the Saudi government. 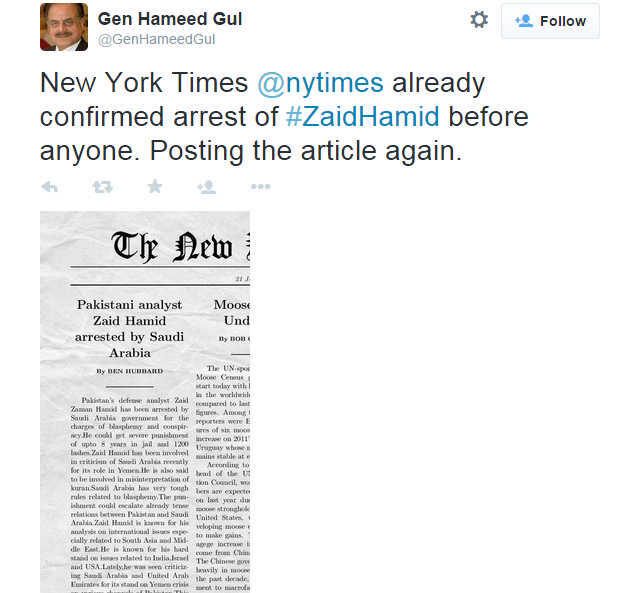 Update about Zaid Hamid’s arrest in Saudi Arabia. The news that Zaid Hamid has been given 8 years jail and 1000 lashes for speaking against the Saudi King is completely false. The source of this false news was a fake twitter account of General Hameed Gul which posted a fake news with this claim. We have confirmed from General Hameed Gul’s team that is a fake account and that General Hameed Gul has no account on Twitter. 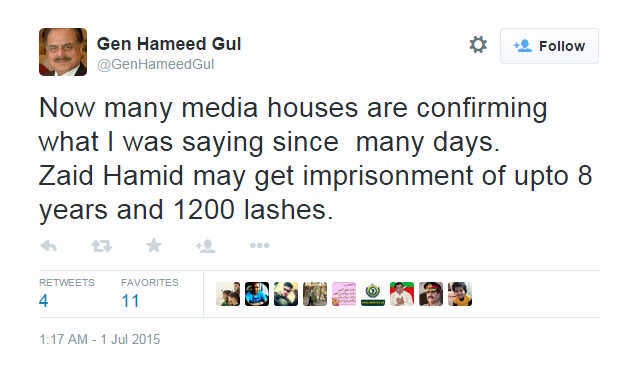 A Din News anchor then did a program based on this fake tweet after which a few blogs published it. Yesterday an Indian blog made a post based on this false news and posted it quoting “Unreliable” sources. This was picked up by the Pakistani media and presented as a fact especially by Express News. The real story which is confirmed by our team is that Zaid Hamid was detained because he was suspected by the Saudis of SPYING for IRAN. They had received intelligence reports of his trips to Iran and knew that he received considerable funding from the Iranian government. At present Zaid Hamid has not been given any punishment but is facing interrogation which is expected to last for a few weeks after which he shall be presented to the court on charges of espionage. We can only hope that the Saudis try him for blasphemy as well. 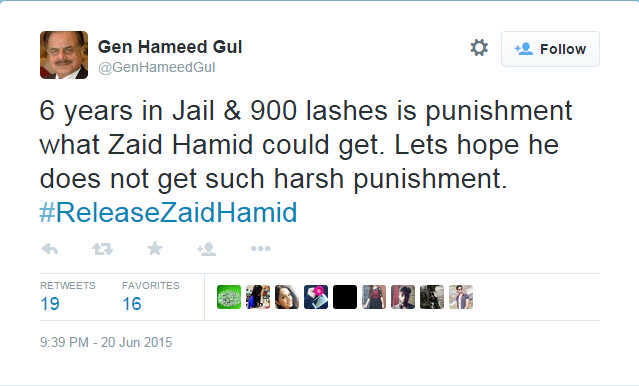 Here are screenshots of the tweets from the fake twitter account of General Hameed Gul. Pakistani journalist/religious commentator Zaid Hamid has been arrested in Saudi Arabia, the Foreign Office claimed on Thursday. According to reports, Hamid was on a visit to the Kingdom with his wife. He was taken into custody after making speeches against the Saudi government. “Our embassy in Riyadh has informed us that Mr Zaid Hamid was arrested about two weeks ago. Since then, the embassy has been working with the local authorities to get consular access,” Foreign Office spokesperson Qazi Khalilullah told a news briefing in Islamabad. “Due to the efforts of the embassy, his wife was able to talk to him. Again, due to the efforts of the embassy, his wife will be able to meet with him on 30 June,” he said without giving further details. ISLAMABAD: Pakistani journalist Zaid Hamid has been arrested in Saudi Arabia, the Foreign Office said on Thursday. According to reports, Hamid was arrested during a private visit to the Kingdom with his wife. He was apparently taken into custody after making speeches against the Saudi government. In 2013, a former aide who left Hamid’s organisation accused him of being on the payrolls of the Inter-Services Intelligence agency to wage psychological operations against those opposed to the Pakistani security establishment.